This book is a collection of 18 stories. Each is an allegory for one or more events in the Bible. Each use descriptions that are similar in language to the Bible. Each has a Proverb which it cites as the moral of the story. The book is best when the parent interacts with the kid asking different questions and helps them to understand some of the simpler allegories.I enjoyed most of the stories, but some attempted to "weave in" a few too many allegories within a single story. The moral of the story was sometimes only weakly taught, but in all cases there was a moral(s) a parent could teach their son/daughter. I very much enjoyed reading it to my 4yo son.Interview with my 4yo son after reading it:What did you think of this book? I liked it and I think my friends should read it.What did you like about it? I just liked how what they taught us.What are some of the things they taught us? That you shouldn't be mean.What else? They also taught us that you should not kill innocent people. Just like Scottish Seas and Kill the Dragon, Get the Girl.What else? That you shouldn't try to get someone to remarry them [while they're still married to someone else].Which story was your favorite? My favorite story was "the Blind Stanger. "What did you like about that story? I just liked it when the stranger was knitting the clothes.What did you learn in that story? That you should not kidnap little kids.What does "allegory" mean? It means different things that happen the same.What is an example of an allegory? With Ivy and then the prince killed the dragon. (This is in reference to a book we read a couple books a go called Kill the Dragon, Get the Girl. )What was that an allegory for? For God killing the devil.Anything else to say about "Wise Words"? Nope. I've read it once and listened to it several times. The only stories in the world that rival Narnia in my affections. Every one is simply beautiful. If only Dr. Leithart wrote all his books as stories!-----Listened to again January 2013. I reset the finish date so I can count it for this year. Last year's book total was so pitiful...I'm determined to at least exceed it in quantity! This is a book of "family stories that bring the Proverbs to Life." The children loved it and the reason it took so long to finish it was because they kept wanting to go back and read one of the stories we had read previously instead of going on to a new one. :)Alan and I liked the book for the most part, but some of the stories were better than others and a couple had some Calvinist undertones that we edited while reading aloud. 2x through. 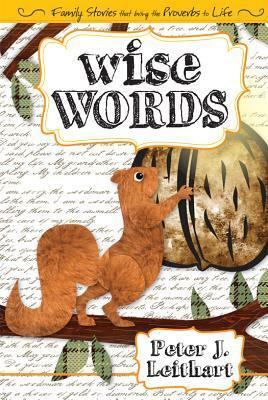 I've read this book of Proverbs-based children's short stories before and loved it. In 2015, I read it to my 4 children (aged 4-11) and they all loved it as well. Each story is a triple-layered delight, illustrating a wisdom concept from the Proverbs, often by using the pieces or else the kernel of one of Jesus' parables, and all told in a Grimmesque fairy tale format. These are a delight for children and parents alike. This book was a delight for our entire family to read. The stories build from the book of Proverbs and include quite a bit of biblical imagery throughout. It's great for family devotions and not only for children. I can't think of a better recommendation than that of my three-year old: "Daddy, these stories are really appetizing me." Yet another book my dad read aloud when I was young. I still remember meeting Dr. Leithart afterwards and thinking, "Authors are real people." A charming read. Sees Proverbs as a typology between Lady Wisdom and the Whore. A fantastic book of short fairy tales. Each has a moral drawn from the Book of Proverbs, but with lots of other Biblical allusions as well. Great for reading with your children. I have the third edition with the new cover. The book is a wonderful collection of short fairy tales for children based out of the book of Proverbs. As a matter of whimsy, I enjoyed that each story ended like Aesop's Fables with a moral that was a verse out of Proverbs. But the stories are often full of profound insight beyond the key Proverb being illustrated. There is always a Christ-figure in each story, many of which are very clever. Some, like "The Monster's House" actually subvert the fairy tale structure to great effect, and if you know your Bible there are many other passages that they stories illuminate. These 18 stories have been delightful as I've read them for the girls at bedtime. For those with biblical literacy there are allusions woven throughout which make it all the more enjoyable. However, knowledge of the Bible isn't a prerequisite as each story stands on it's own and is based off of a Proverb, listed as the moral at the end of each chapter. We loved the book and highly recommend it though it's probably more appropriate for 7-10 year olds since there are some themes that might be a little intense for younger kids. Most of these stories turn out pretty fun. There were a couple as another review said that were "wobbly" but still spot on. We read this to our girls (5,3,2) -- there is something for all ages there. For my two year old it's learning to sit still during that time. :) This will be a book we read again and again because there will always be something to gain from it. And it will be fun to watch when my girls really clue in to some of the humor aspects that are interject for the grown-up crowd. HA! Mr. Leithart accomplishes what many of us fathers try to do at family worship with little ones. He presents biblical principles in short story format which all of my children loved (as well as their parents). The favorite of our family is the story of fairies and walnuts. If you are new to doing family worship with little ones, then I would recommend starting with this book and then read the Bible verse that corresponds to the story. This little book of separate chapter stories was quite well received in my house! Not only do they work a Proverb in as a focus of each story, but many other "classic Bible stories" are woven throughout, including a lovely picture of the gospel in the last story. While the writing is not at the level of a true classic, my children enjoyed the stories very much, and many of them prompted some great discussions! Each story does illustrate the proverb that Dr. Leithart labels as the moral at the end of the story, but he draws on so many parts of scripture for each, as well as the literary devices of the great fairy tale tellers. He sparks the imagination, but I would love to see a fine illustrator's interpretation of a few of these tales. I read this book to my 5 and 6 year old kids and they enjoyed it a lot. Some stories were light and funny, others rather grim (much like the book of Proverbs, upon which it's based). I loved the Biblical images woven in to the stories and found many of them quite moving. This will be a good book for us to re-read together every year or two. Very simple stories. Some were amazingly beautiful, and some of them smelled like they came straight from the Fractured Fairy Tale Factory (e.g. this has got to be the only fairy tale where a dragon succumbs to his fate after a copy of St. Augustine is inflicted upon him!) Perhaps simple wasn't the word to describe it, but ah well. Leithart writes so that the story is entertaining to children and yet instructional to them as well. It is also one of those books that reaches the adult as well, reminding us of our need to make application of Proverbs. It speaks simply and succinctly on many levels and therefore was a joy to read to the children. A good book with stories that elaborate on the Proverbs that also tie in with other biblical themes. One story is a bit spicy as it tells the story of man seduced by a harlot. It is still kid friendly, but probably for older children. Elanor very much enjoyed these short chapters every dinner every night for the last few weeks. (She's five and a half). One was a little bit gory and a couple were not clear enough, but a very good book none the less. Highly recommended for family devotional material. A fabulous little book. Leithart does a wonderful job interweaving Wisdom motifs and redemptive themes through a number of fairy tales. This would be a great resource for parents to use in tandem with Proverbs. One of the best children's books out there.Peter Leithart does a unique thing in this book. He relates Scriptural stories, proverbs or truths by telling simple fairy tales. Highly recommended for the reader to experience the narrative dimension of truth. What a great bedtime read-aloud for the children. Every story leaves the children (and father) wanting more. Every story provides profound teaching opportunities not only as to the wisdom of Proverbs, but as to the truly wise one, Christ! I loved reading this book to the kids and discussing the morals which followed each story. Good descriptive stories that were enjoyed by kids of all ages. Best modern fairy tales ever! If you didn't already realize it, fairy tales are ideal for learning how to read wisdom literature. I look forward to reading these to our kids. First read Jan 26, 2009. Now read out loud to the kids. They enjoyed very much. Fun stuff; creative with a great message. This is by far my favorite children's story book. Every Christian parent should read these short stories to their children at least once. My children loved them! I really enjoyed reading these stories to my children. Peter J. Leithart - Peter Leithart received an A.B. in English and History from Hillsdale College in 1981, and a Master of Arts in Religion and a Master of Theology from Westminster Theological Seminary in Philadelphia in 1986 and 1987. In 1998 he received his Ph.D. at the University of Cambridge in England. He has served in two pastorates: He was pastor of Reformed Heritage Presbyterian Church (now Trinity Presbyterian Church), Birmingham, Alabama from 1989 to 1995, and was founding pastor of Trinity Reformed Church, Moscow, Idaho, and served on the pastoral staff at Trinity from 2003-2013. From 1998 and 2013 he taught theology and literature at New St. Andrews College, Moscow, Idaho, where he continues to teach as an adjunct Senior Fellow. He now serves as President of Trinity House in Alabama, where is also resident Church Teacher at the local CREC church. He and his wife, Noel, have ten children and five grandchildren.